Brown Bear Hunting...to Spot and Stalk or to Ambush? When doing a spot-and-stalk hunt for brown bear, it’s important to do your due diligence and study up on your prey. Brown Bears – Spot and Stalk or Ambush? When doing a spot-and-stalk hunt for brown bear, it’s important to do your due diligence and study up on your prey. Unlike mule deer, they aren’t as likely to just run over the hill at the sound of a snapping twig. They don’t like being surprised, so you need a solid game plan, the ability to move quietly and stealthily, and the fortitude to maintain your cool under stress. Start by finding natural food sources that bears like. These change depending on the season. In spring they are somewhat lethargic and stay close to the den initially. They feed in short spurts because their stomachs are shrunk from not eating all winter. They’ll be looking for any available greenery to jump start their digestive tract. In the fall, they are on a mission, trying to fatten up before hibernation. They will be looking for berries, honey, oats, clover, wheat, fish and any other food sources they can find. You need good footwear, preferably something lightweight, non-bulky, with shallow tread, and easy to put on and take off. Make sure you are well covered with no skin showing as brown bears have sharp vision and can spot you from miles away. Wear clothing that allows you to move quietly because they also have excellent hearing. Fleece and wool are great choices provided it allows you to blend in with your surroundings. Use existing cover, keeping your limbs in close and crouch low to the ground when making your final approach. Do anything you can to not look like a human, staying downwind and watching for wind changes as you move. Bears can smell a carcass 20 miles away; he’ll smell you at 30 yards. If you are using archery equipment, it would be wise to have practiced shooting targets 60-70 yards away. Planning to ambush your bear? You will need to identify a choke point or transition area. Make your blind crosswind of their feeding area, leaving an opening or shot window free of obstructions. 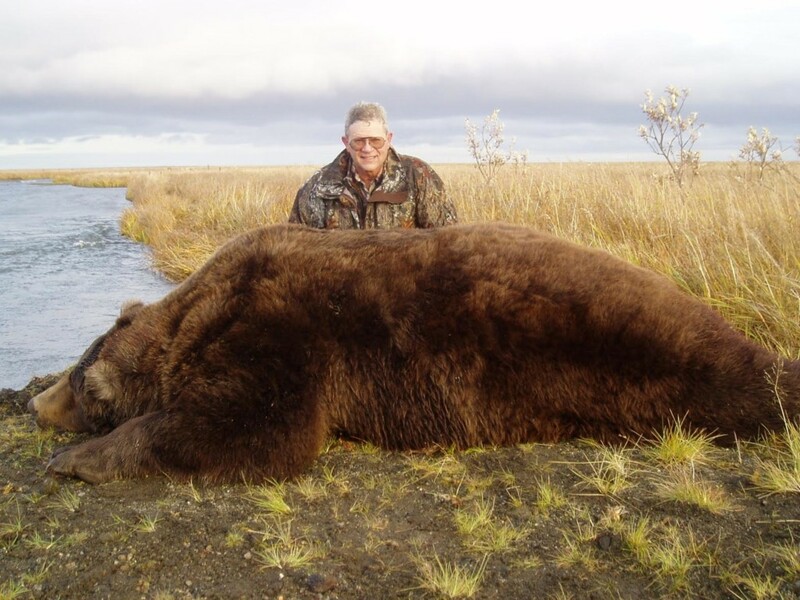 Make your blind well before the hunt as bears are acutely aware to changes in their surroundings. Although they may be dangerous, and tough to get in to bow range on, you may find this to be one of the most rewarding hunts when everything comes together. Shooting an animal from across the canyon can come with a little bit of disconnect. But when your 30-60 yards away, you can hear every movement, see every twitch, you can smell them. When you spot and stalk within bow range on any wild animal, you can feel the hairs on the back of your neck stand up, you can feel yourself connect with something primitive inside you. It’s a very personal, emotional, even spiritual experience. Where do the Largest Brown Bears Come From?